It would be nice to think that every dog that went into the care of an animal rescue organisation found a new home quite quickly. Sadly that isn’t often the case, a number of dogs spend far too long in kennels before finding their right home. When a home does result though it is wonderful for the dog and all who have been involved closely with him/her whilst in kennels be they the kennel staff, volunteer walkers or volunteers who are involved in the rehoming process. One such case for us is Scarlet. 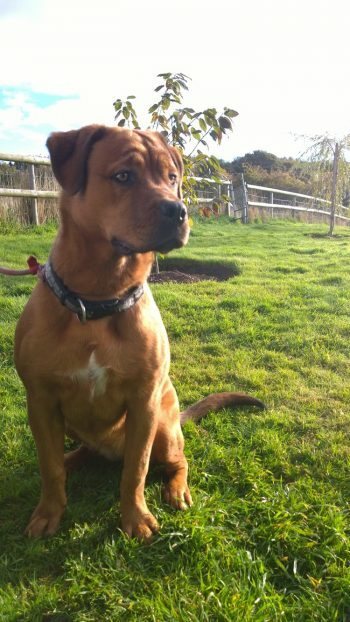 Scarlet is a very young Dogue de Bordeaux (or possibly Ridgeback!) X Rottweiler. A very big girl! Scarlet was in kennels for almost all her 3 years before she gained the wonderful home she now has. She was a stray dog only 6 months old who was quite scared and lacking in confidence when she arrived. Information subsequently gained indicated she had a very poor start to her young life and was quite apprehensive of meeting new people, particularly men. It took the kennel staff a long while to build up her confidence. We were getting quite worried about Scarlet and really hoped she wasn’t going to have to spend all her years in kennels. At the end of last summer though she started getting visits from a gentleman whose beloved Rottweiler William had sadly died. He came just to visit the dogs and of course take them lots of treats, sausages being the favourite! 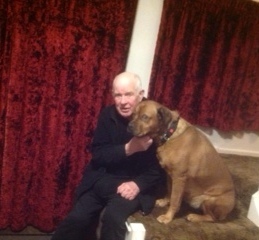 Scarlet was in a neighbouring kennel to one of the Rottweilers and the thought of sausages and attention from this kind man helped overcome her apprehension and fears to quite a large extent! These visits went on for many months and Scarlet began to show real affection for him. The gentleman had really thought his dog owning days were over though. 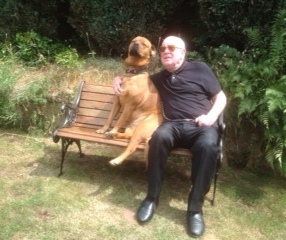 He had owned a number of Rottweilers in his life but had started to content himself with just visiting the kennels, as he will say himself ‘he isn’t a youngster anymore’! He couldn’t bear to see Scarlet staying in kennels any longer though. The process was not rushed though but gradual over a period of time with him walking with kennel staff initially with Scarlet, then he would take her on his own around the field. Short visits home for Scarlet with a member of the kennel staff accompanying her then followed. We carried out the normal new home checks and discussed the support that we could put in place to ensure this match would be successful. This resulted in a permanent foster agreement being agreed which means Cheadle & District Animal Welfare Society will always provide the support and backup for Scarlet. Scarlet has now been in her fantastic permanent foster home since February as a result of all the preparation that had gone before. 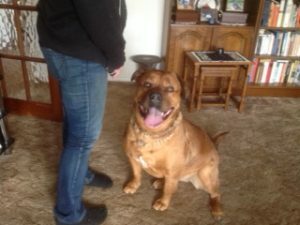 Arrangements were also put in place for her ex kennel girl, who already knew and had looked after Scarlet to continue to take her for regular long walks each week, leaving her owner to take her on daily shorter walks. Her new ‘Mum and Dad’ though provide the vital components for Scarlet, patience, lots of love and attention and a fantastic home life. 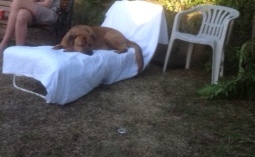 Scarlet in return has given so much back already as if to say thank you for giving her such a wonderful new life. She has come on in leaps and bounds and has settled in so amazingly well after being in kennels for so long. Over the summer there have been great photos of Scarlet clearly enjoying herself including having her own sun lounger and sun glasses! 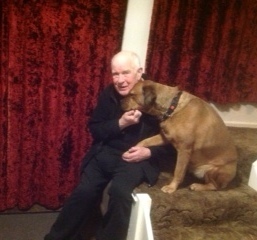 A visit to see Scarlet is always lovely and her welcome is second to none! Almost a year since Scarlet went to live in her wonderful home. She is devoted to her owners, particularly her ‘Dad’! She is such a confident and happy girl now who has learnt to trust people again.